Product prices and availability are accurate as of 2019-04-19 09:09:01 UTC and are subject to change. Any price and availability information displayed on http://www.amazon.com/ at the time of purchase will apply to the purchase of this product. ***As seen in Mother & Baby and Today's Parent Magazine*** "Gorgeous, handmade play tents" - Entrepreneur Magazine Meet the newest Domestic Objects product! 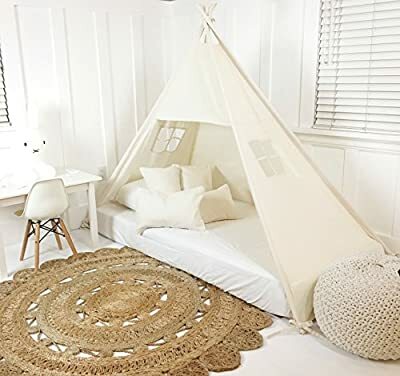 Its a play tent shaped bed canopy (now available with doors) that fits over top of your mattress on the floor (you choose the size). This is perfect for you toddler who is transitioning from being into a crib to a bed. Its also perfect if you don't have room for one of our free standing play tents. There are two reinforced windows on either end. How does it stay stable? The 4 legs of the tent tie into the corners of the mat that is placed underneath your mattress. There are fabric ties at the top to hold the poles together for extra stability. Velcro door ties hold the doors open, or let them hang closed. Made to for a standard single size mattress 38 x 75". It must be 8" thick or less. Made from 100% cotton natural unbleached canvas. **Will be shipped WITH poles worldwide ** We use PVC pipe as the structure of all our play tents. PVC pipe is the safest and lightest option we could think of for a play structure for kids. We even designed our play tent around it!